Hockey is a passionately played sport in Canada and of course hockey is the most popular sport in Canada. NHL Faceoff 2001 was a dismal effort by 989 Sports and Sony to create a great hockey experience. After having played my share of NHL 2k3, NHL 2003 and NHL Faceoff 2003 I have come up with an answer to the best hockey game of the 2002-2003 season. Read our review and find out! While this year’s version is a big improvement from Faceoff 2001 that is really not saying much. The game look like a Psone game and the player models badly needed more work. Perhaps the only good part of the graphics is the shiny helmets, which seem to be a little over exaggerated. The goalie helmets and pads look terrible and bland and so do the player jerseys. The player’s hockey sticks looks misshapen and the bench players look terrible as well. One noticeable problem occurs when your player slams into the boards the glass appears as if it’s going to fall out since different pieces move separately from one another. The goalie saves are nice though. Probably one of the better parts of this game the commentating is almost dead on and doesn’t seem to repeat itself much. This is probably the best commentating for any hockey game I have played this year. NHL 2003 has to commentating that is too off-track while NHL 2k3 is too repetitive. Defense has been the main focus of all of 989 Sports titles this year. To start off NHL Faceoff 2003 has probably the most game modes of any hockey game I have played this year. You have your basic exhibition mode, season, playoffs, tournament, franchise, and practice and shootout mode. Franchise mode allows up to ten seasons’s to be played with the same team. This year’s version of Faceoff suffers from a great majority of flaws, which brings it down totally. To start off with this year’s speed of gameplay seems to have taken an approach of a sim but falls short with its non-fluent gameplay mechanics. The game just doesn’t feel fluid and fast as most other hockey games are. Some of the player movement needs some work such as the goalies coming out of the net to come contest the puck. They don’t change their motion in a position they would in real life to stop a puck from going around the boards. Not only that but the game suffers from a poor and sometimes too good AI and player control issues as well. Depending on what mode you play on the AI can either be very good or very bad. There is no direct balance between both. At the lowest level the beginning player will soon get plenty of breakaways but the goalies always do a good job of robbing you. Another problem is the goalie AI as well. The goalies will usually stop the hard shots but often let in weak goals from the blue line or bad angle shots, which will usually go blocker side. On the much tougher modes the AI will do whatever is necessary and I mean whatever to avoid a goal in their zone, even if that means injured players. NHL Faceoff 2003 seems to remind me of ESPN National Hockey Night which came out in the fiscal year of 2001 for Playstation and was even worse than Faceoff. The player puck movement was the worst aspect of the game and Faceoff suffers from this same problem. A player with the puck will often lose the puck when working around the boards. In other words if your too aggressive your player will lose the puck if he is not being contested by anyone along the boards. What is up with that? The game’s franchise mode doesn’t particularly have any innovative features and is just as regular as EA’s NHL 2003’s franchise mode. The franchise mode does allow multi teams to be included in a season or franchise mode. The game menu’s especially the season setup menu’s are not user friendly. I spent quite a while searching for the save screen since the menu doesn’t list how to access it. Another problem is the lack of customization NHL Faceoff 2003 has when compared to NHL 2k3. One of my biggest problems was the camera angle. I usually play at a horizontal camera angle but the game has no adjusting zoom feature or user defined cam. In NHL 2k3 the user has control over every little part of the game up to puck friction, shot blocking and even puck friction while Faceoff has none of these. The fights in this year’s game are done well and the coolest addition is that the goalies can actually get into fights. This is the first hockey game I have ever seen implement this feature. The hits are also done incredibly well and are the best you’ll see in any hockey game next to midway’s respectable NHL Hitz franchise. Even these advantages can’t make up for the game’s problems. The controls are not so bad and 989 Sports has added one cool feature, which is the drop pass button, which is triangle. You player can drop the pock for a player behind him and let him wire it home. Now here is where the in game problem lies. It’s almost impossible to execute because the AI can get overly aggressive when you are trying to perform this move. Another problem is the lack of the dumb puck button. The only way to dump the puck is to gently tap the square button, which doesn’t feel natural. 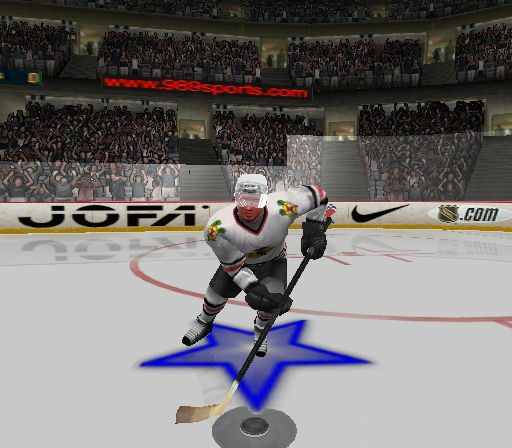 NHL 2k3 implemented the use of triangle button for dump pass. With too many in game flaws and lack of customization you’ll be lucky if you can get through one season of NHL Faceoff 2003. To make things worse the graphics add even more terrible things to the big picture. The game gets old quickly after a few rounds of play. Still asking what is the best hockey game this year? 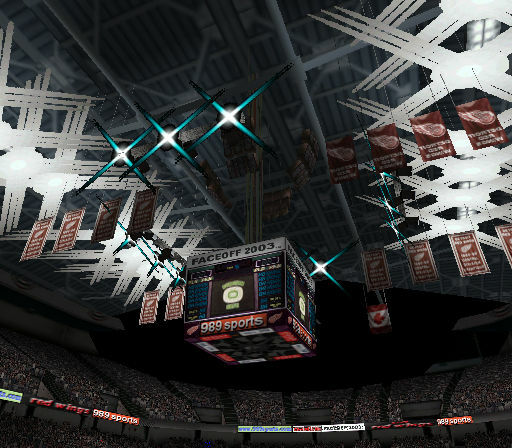 Drum roll…the winner is NHL 2k3 by Sega Sports and Visual Concepts hands down. The game’s simulation style play will win over any serious or arcade fan after just a few minutes of play. Meanwhile NHL Faceoff 2003 doesn’t do much for itself and it’s hard to imagine NHL Faceoff 2003 every being a competitor again as its competitors keep excelling year after year. Hopefully next year’s version will include online play and go through a major overhaul like NFL Gameday 2003 did.